What are outcomes made of? This talk will explore the dark matter of the outcomes of service design work. As an industrial designer or even digital product designer, outcomes are clear and concrete - a new piece of furniture is in market, or an update to the app or website has been shipped. For service designers, we grapple with the non-’thing’-ness of the work we are doing. What is a service made of, and how can we tell when we really made an impact on it? How might we expand our thinking to consider a range of outcomes, from implemented, in-market, physical and material changes, to shifts in mindsets, perspectives, and the creation of new conversations and capabilities? Service design is having a crisis of confidence regarding the impact of our work. Let’s delve into a taxonomy of outcomes, and think in a broader and more nuanced way about impact. Linn is one of Canada’s leading advocates of service design, and co-founded Service Design Toronto in 2013. She is currently an independent designer based in Toronto. 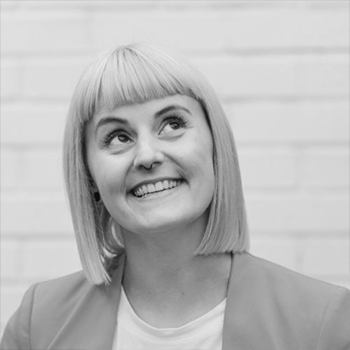 In her previous role as Director, Design Strategy at Bridgeable, she applied service design methodologies to solve client challenges in fields like banking, telecommunications and the public sector. She is a respected contributor to Touchpoint, the journal for service design professionals, as well as writing frequently for Adobe on design. Linn has spoken around the world at events like Interaction (the IxDA conference), Adaptive Path's Service Experience Conference and the Global Service Design Network Conference. Linn loves teaching and mentoring the next generation of designers, and often guest lectures at universities, as well as teaching at Hacker You in Toronto. She loves glitter, dancing, and cats, and can deadlift over 220 pounds.